Rebel fighters are reported to have captured large parts of a big military base in northern Syria, the latest in a string of losses by government forces. The attack on Base 111 at Sheikh Suleiman, about 25km (15 miles) west of the city of Aleppo, on Sunday, was said to have been led by Islamist militants. Video posted online showed them seizing military vehicles, including a tank. The assault came as UN envoy Lakhdar Brahimi said he had held "constructive" talks with US and Russian officials. They had "explored avenues to move forward a peaceful process and mobilise greater international action in favour of a political solution", the Algerian diplomat added. "All three parties re-affirmed their common assessment that the situation in Syria was bad and getting worse. They stressed that a political process to end the crisis in Syria was necessary and still possible." They reportedly agreed that a solution would be based on the core elements of the final communique issued on 30 June after international talks in Geneva which called for a transitional government. On Monday, Russia's foreign ministry called for the start of a national dialogue, but stressed that "fundamental decisions" had to be "made by Syrians themselves, without outside interference". Rebel forces are said to have entered Base 111, whose headquarters are in Sheikh Suleiman, on Sunday afternoon after weeks of fighting. 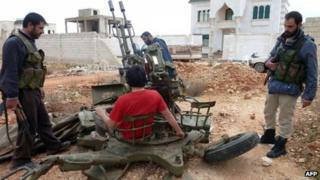 The videos posted online showed rebels driving around in a captured tank and manning anti-aircraft guns. They also showed the rebels sporting the insignia and black flags of radical jihadist militants. A journalist for AFP news agency on the ground said many of them were from abroad, and that the attack had been led by the al-Nusra Front and related groups. The rebel Free Syrian Army was not involved in the assault, according to the Syrian Observatory for Human Rights (SOHR), a UK-based activist group. The BBC's Jim Muir in Beirut says the sprawling base was the only significant government facility remaining in a broad stretch of countryside west of Aleppo. Last month, the rebels captured another large base nearby at Atarib. In Aleppo itself, rebels are still in control of at least half the city, despite attempts by government forces to dislodge them. There too, jihadist groups are reported to have largely displaced the FSA, highlighting the dilemma of Western countries as they ponder whether to allow sophisticated weapons to pass to the opposition, our correspondent adds. On Monday, government warplanes reportedly bombed suburbs of the capital, Damascus, amid fierce clashes in the surrounding countryside. A jet carried out an air raid on the western suburb of Darayya as rebels and soldiers fought, while artillery bombed nearby Muadhamiya, the SOHR said. Towns and villages to the east were also bombarded.